Enhances the integrity of the Aura - body strengthening. Helps integrity of natural protective field from the impact of wifi, radiation, microwaves, geopathic stress & pollution. This is a formula that everyone could do with at these times of invasive microwave and wifi technological saturating our energy fields and environments. We are all exposed to great amounts of microwaves that have a detrimental effect on our health, reproductive organs and the brain. Use when ever you feel the need, e.g before/during/after working on your computer, to help counteract invasive electromagnetic fields. Use when watching T.V, before and after radiation therapy, in and out of visits to hospitals and when traveling on airplanes. Use before or after going through the radioactive scanning machines, having x-rays, etc. Be sure to switch your Wifi off at night, and reduce contact with cellular phone as much as possible. Reducing exposure to electrical appliances and Wifi is very important for health on all levels. 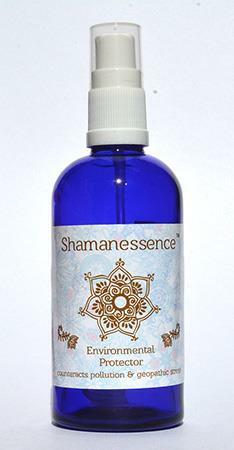 This spray includes the flower essence of Lace Flower to strengthen one's self-worth, which is reflected in ones auric fields strength. Special Yarrow Formula, Cypress, Lemon & Juniper essential oils are in this unique vibrational Environmental Protection formula, created to strengthen and protect our electromagnetic field as much as possible during a very challenging time for humanity. Active Ingredients: Yarrow Special Formula combo: yarrow (Achillea millefolium (white), Arnica Mollis, Echinacea Purpurea, in sea salt base. Lace Flower, Emergency Trauma Solution Plus (108 frequencies), Corn flower essence. Essential Oils: Lemon, Cypress, & Juniper. In Blessed Structured spring water, grapefruit seed extract, and love! Shale well to activate frequencies! Read under the title long description above for full details.